This year we’ve got a special opportunity to learn new skills. We’ll learn how to maximize any shooting opportunity by recording video footage along with our photographs and we’ll learn how to make some cash doing it with Adobe Stock. Not only will we practice making videos, but Jim Nix (thanks, Macphun) will be joining in to help us make terrific HDR images. 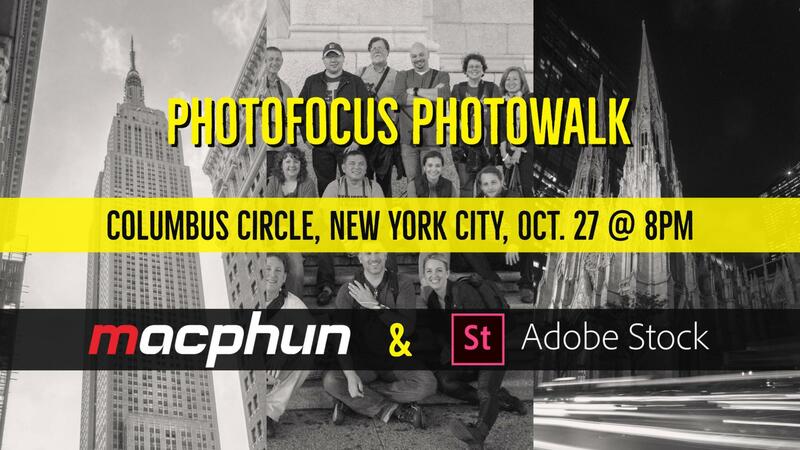 And of course, several of the Photofocus authors will be there and would love to meet you. Richard Harrington, Kevin Ames, Vanelli, Rob Sylvan, Pamela Berry, Levi Sim, Bobbi Lane, Lee Varis and maybe a few more will be along on the walk. Charge your batteries and clear your memory cards–we’ll be recording lots of video and shooting HDR brackets which eat both memory and battery life, so bring along extras of both of those. We’ll be doing standard photowalk stuff, too. Bring a wide lens, and something moderately telephoto, but don’t overburden yourself. Tripods are not allowed in the city. I’ll be using my Platypod Ultra–and I’ll have several Platypods on hand for you to borrow (or you can buy your own at the show during the day). Bring your own tripod head for the Platypod. We’ve changed locations this year and we’ll meet on Columbus Circle at the foot of the USS Maine Monument on the corner of Central Park (click here for a map location). From there we’ll probably head toward Times Square so we’ll end up closer to train stations for those traveling home. Let’s meet at 8:00 pm. We’ll shoot for at least an hour, maybe an hour and a half, and have drinks afterward. Be sure to get the free trials of Macphun’s Aurora HDR as well as Luminar. These are terrific apps for finishing your photos, and make sure you know your Adobe login so you start using Adobe Stock, which works directly with Lightroom. Register as soon as you can, we are limited to 50 walkers! This looks great. I belong to a group that does photowalks here in the Dallas area. It’s a lot of fun, I always learn something, and I get a lot of useful photos out of it.